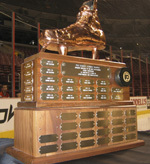 The Philadelphia Flyers presented their 2011-12 end-of-season awards tonight before the start of their final regular season home game against the Buffalo Sabres at the Wells Fargo Center. Claude Giroux was selected by a panel of sportswriters and sportscasters as the Flyers team MVP for the second consecutive year. Giroux will wrap up the season with some of the best offensive numbers for a Flyers player in a dozen years. Heading into tonight’s game, Giroux had 28 goals and 64 assists for 92 points on the season. Not only is it a career high for Giroux in all three categories, but the 92 points are the most by a Flyer since Eric Lindros had 93 points in the 1998-99 season. The 64 assists are the most by a Flyer since Lindros posted 68 in the 1995-96 season, and it’s currently the ninth-highest regular season total in Flyers history. Giroux is just the fourth Flyer ever to record 50 or more assists in consecutive seasons, joining Bobby Clarke (8 seasons, 1972-1980), Brian Propp (3 seasons, 1983-86) and Mark Recchi (2 seasons twice). Giroux currently ranks third in the NHL in scoring and leads the league in power play points. He has had 10 games of three or more points this season. 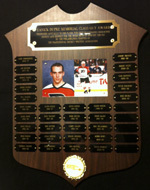 Giroux becomes the sixth player to win the award in consecutive years since its establishment in 1984-85, and becomes the eighth player to win the award multiple times. 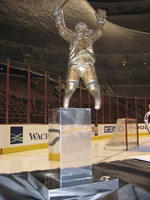 Kimmo Timonen earned his third Barry Ashbee Trophy as voted by a panel of sportswriters and sportscasters. Timonen previously won the award in the 2007-08 and 2008-09 seasons. Timonen entered tonight’s game with four goals (all on the power play) and 39 assists for 43 points, which leads Flyers defensemen in scoring, and has appeared in 74 of the team’s 80 games so far. Timonen’s 43 points and 39 assists are each short of his personal best in the category as a Flyer – he had 44 points in 2007-08 and 40 assists in 2008-09. Timonen becomes the third Flyer to win the award three or more times since its inception in 1974-75, joining Eric Desjardins (7) and Mark Howe (4). Scott Hartnell was named the Flyers’ most improved player from the previous season, as voted by his teammates. Hartnell has enjoyed a career year, having set new personal highs in goals (37) and points (67) while coming into tonight’s game tied with his career high in assists (30). Heading into tonight’s action, Hartnell has seen an increase of 18 points (13 goals, five assists) from last year’s final statistics. Hartnell has been one of the most dangerous power play threats in the NHL this season with 16 power play goals, which ranks second in the league heading into tonight’s games. The Philadelphia chapter of the Professional Hockey Writers’ Association (PHWA) selected Jaromir Jagr as this year’s recipient of the Yanick Dupre Class Guy Memorial Award. 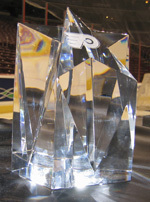 This award is presented annually to the Flyer who best illustrates character, dignity and respect for the sport both on and off the ice. Jagr returned to the NHL this season after a three-year absence, signing with the Flyers as a free agent on July 1, 2011. He enters tonight’s game ranked third on the Flyers in scoring with 18 goals and 35 assists for 53 points in 71 games. 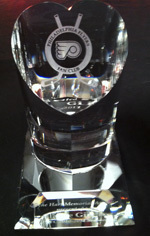 The Philadelphia Flyers Fan Club selected Wayne Simmonds as the winner of the Gene Hart Memorial Award. This award is given to the player who demonstrated the most “Heart” during the season as voted on by members of the Fan Club at their monthly meetings. Presenting the award to Simmonds was Flyers Fan Club president Joe Fisher and Fan Club member Josh Ash, along with Sarah and Lauren Hart. The Flyers Fan Club will also donate $2,000 to the charity of Simmonds’s choice. 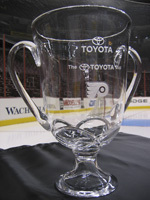 Claude Giroux has won this season’s Toyota Cup as the Flyer who accumulated the most points associated with being selected as a “Star of the Game.” Entering tonight’s game, Giroux has been named First Star 11 times, Second Star seven times and Third Star four times for a total of 80 points. Five points were awarded for being selected First Star, three points were awarded for a Second Star performance and one point was awarded for a Third Star selection. Presenting Giroux with the award was Paul Muller, representing the Tri-State Toyota Dealers. In addition, the Tri-State Toyota Dealers will make a $5,000 donation to the charity of Giroux’s choice. "The Tri-State Toyota Dealers are so proud to once again support the Philadelphia Flyers through the Toyota Cup," said Muller. "This is such a special award really because it symbolizes what the Philadelphia Flyers are all about; a team that while being successful on the ice, has never forgotten the good of the community. We are happy to have Claude Giroux, one of the bright young talents of the game, carry on this tradition and to make a $5000 donation to the charity of his choosing on behalf of the Tri-State Toyota Dealers." In addition to the Flyers team awards, goaltender Ilya Bryzgalov received a Tiffany crystal from the National Hockey League during the ceremony to commemorate his 25th career shutout, recorded on Feb. 7 vs. the New York Islanders. Presenting the award was Jim Gregory, SVP of Hockey Operations for the NHL.